The Seven Basic Plots: Why We Tell Stories is a 2004 book by Christopher Booker containing a Jungian-influenced analysis of stories and their psychological meaning. Booker worked on the book for thirty-four years. The meta-plot begins with the anticipation stage, in which the hero is called to the adventure to come. This is followed by a dream stage, in which the adventure begins, the hero has some success, and has an illusion of invincibility. However, this is then followed by a frustration stage, in which the hero has his first confrontation with the enemy, and the illusion of invincibility is lost. This worsens in the nightmare stage, which is the climax of the plot, where hope is apparently lost. Finally, in the resolution, the hero overcomes his burden against the odds. The key thesis of the book: "However many characters may appear in a story, its real concern is with just one: its hero or heroine. It is he with whose fate we identify, as we see him gradually developing towards that state of self-realization which marks the end of the story. Ultimately it is in relation to this central figure that all other characters in a story take on their significance. What each of the other characters represents is really only some aspect of the inner state of the hero or heroine themselves." Definition: The protagonist sets out to defeat an antagonistic force (often evil) which threatens the protagonist and/or protagonist's homeland. Examples: Perseus, Theseus, Beowulf, Dracula, The War of the Worlds, Nicholas Nickleby, The Guns of Navarone, Seven Samurai (and its Western remake The Magnificent Seven), James Bond, Star Wars. Examples: Cinderella, Aladdin, Jane Eyre, A Little Princess, Great Expectations, David Copperfield, The Prince and the Pauper, Brewster's Millions. Examples: The Odyssey, The Pilgrim’s Progress, The Lord Of The Rings, King Solomon's Mines, Six of Crows, Watership Down, Lightning Thief, Apocalypse Now. Examples: Ramayana, Alice in Wonderland, Goldilocks and the Three Bears, Orpheus, The Time Machine, Peter Rabbit, The Hobbit, The SpongeBob SquarePants Movie. Mad Max: Fury Road, Brideshead Revisited, The Rime of the Ancient Mariner, Gone with the Wind, The Third Man. Definition: Light and humorous character with a happy or cheerful ending; a dramatic work in which the central motif is the triumph over adverse circumstance, resulting in a successful or happy conclusion. Booker makes sure to stress that comedy is more than humor. It refers to a pattern where the conflict becomes more and more confusing, but is at last made plain in a single clarifying event. The majority of romance films fall into this category. Examples: A Midsummer Night's Dream, Much Ado About Nothing, Twelfth Night, Bridget Jones's Diary, Music and Lyrics, Sliding Doors, Four Weddings and a Funeral. Definition: The protagonist's character flaw or great mistake which is their undoing. Their unfortunate end evokes pity at their folly and the fall of a fundamentally good character. Examples: Macbeth, The Picture of Dorian Gray, Carmen, Bonnie and Clyde, Jules et Jim, Anna Karenina, Madame Bovary, John Dillinger, Romeo and Juliet, Julius Caesar. Examples: "The Frog Prince", "Beauty and the Beast", The Snow Queen, A Christmas Carol, The Secret Garden, Peer Gynt, Groundhog Day. The simple, or cumulative three, for example, Cinderella's three visits to the ball. The ascending three, where each event is of more significance than the preceding, for example, the hero must win first bronze, then silver, then gold objects. The contrasting three, where only the third has positive value, for example, The Three Little Pigs, two of whose houses are blown down by the Big Bad Wolf. William Foster-Harris' The Basic Patterns of Plot sets out a theory of three basic patterns of plot. Ronald B. Tobias set out a twenty-plot theory in his 20 Master Plots. Georges Polti's The Thirty-Six Dramatic Situations. Several of these plots can also be seen as reworkings of Joseph Campbell's, work on the quest and return in The Hero with a Thousand Faces. Scholars and journalists have had mixed responses to The Seven Basic Plots. Some have celebrated the book's audaciousness and breadth. The author and essayist Fay Weldon, for example, wrote the following (which is quoted on the front cover of the book): "This is the most extraordinary, exhilarating book. It always seemed to me that 'the story' was God's way of giving meaning to crude creation. Booker now interprets the mind of God, and analyses not just the novel – which will never to me be quite the same again – but puts the narrative of contemporary human affairs into a new perspective. If it took its author a lifetime to write, one can only feel gratitude that he did it." Beryl Bainbridge, Richard Adams, Ronald Harwood, and John Bayley also spoke positively of the work, while philosopher Roger Scruton described it as a "brilliant summary of story-telling". Others have dismissed the book, criticizing especially Booker's normative conclusions. Novelist and literary critic Adam Mars-Jones, for instance, wrote, "He sets up criteria for art, and ends up condemning Rigoletto, The Cherry Orchard, Wagner, Proust, Joyce, Kafka and Lawrence—the list goes on—while praising Crocodile Dundee, E.T. and Terminator 2". Similarly, Michiko Kakutani in The New York Times writes, "Mr. Booker evaluates works of art on the basis of how closely they adhere to the archetypes he has so laboriously described; the ones that deviate from those classic patterns are dismissed as flawed or perverse – symptoms of what has gone wrong with modern art and the modern world." 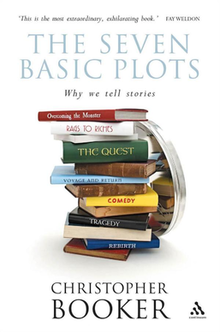 ^ "The Seven Basic Plots of Storytelling". www.greenbelt.org.uk (Podcast). 2006. Event occurs at 01m00s. Retrieved 2013-09-11. ^ a b c d e f g Bateman, Chris (2005-10-11). "The Seven Basic Plots" (blog). Retrieved 2013-09-10. ^ "the definition of comedy". Dictionary.com. ^ a b c "The "Basic" Plots in Literature". Retrieved 2013-09-11. ^ "The Seven Basic Plots". Bloomsbury. Retrieved 2013-03-19. ^ Scruton, Roger (February 2005). "Wagner: moralist or monster?". The New Criterion. Retrieved 19 March 2013. ^ Adam Mars-Jones "Terminator 2 Good, The Odyssey Bad", The Observer, November 21, 2004, retrieved September 1, 2011. ^ Kakutani, Michiko (2005-04-15). "The Plot Thins, or Are No Stories New?". The New York Times. Retrieved 2013-09-11.